Divi Blurb Extended is a plugin for Divi Theme which also works with Extra and Divi Page builder. This is the second plugin launched for Divi by Elicus Technologies after Divi Blog Extras and is available on DiviExtended.com. This plugin comes with added features along with standard Divi Blurb functionalities. 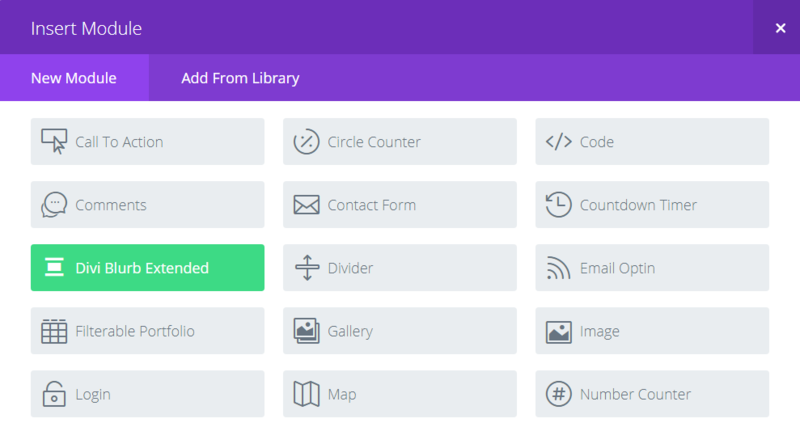 Divi Blurb Extended allows more control on creation of layouts with Divi. How to Install and Activate Divi Blurb Extended? Divi Blurb Extended plugin can be ordered here. There are two type of license. The single site license of Divi Blurb Extended can be used on one website. The extended license is for developers or users who have want to use the plugin on more than 1 website. The plugin zip file can be downloaded after the order and need to be installed as any other plugin. There is another step invovled which is for the activation of plugin. The activation key can be obtained from Downloads page. After the API key is saved and the plugin in activated, there will be Divi Blurb Extended module available in the module library. How to Set up a section using Divi Blurb Extended? Once the plugin is active, it can be used like any other Divi module by adding it to a pag section. Using Divi Blurb Extended plugin is extremely easy and it can be added to any page using Divi Builder in a standard and speciality section. The common features for all the layouts in Divi Blurb Extended are read more button, Icon on right, color change of icons and more to achieve desired blurb. List of available Divi Blurb Extended layouts with Example. Here is an implementation where icon position, read more link and border shape squire can been seen created using Divi Blurb Extended. Icons in square and hexagone shape along with circle. Classic layout is similar to the divi blurb but has added feature of read more button and two new shapes along with cirlce and hexagon. But we can get more like this example with a hover effect using Flipbox. In this Divi Blurb Extended Flipbox layout, we have an image site section that can be created to show the image and name and a short description with hover. The ring in the middle is a static image. On hover animation to top with Easebox. Borderbox comes with option to create border around the blurb like this example. Image Card layout can be used to create really nice looking sections like this. Another layout created using Image card layout. These are the avialable options in Divi Blurb Extended and can be used to create layouts like shown above. The full demo site and order link are at the end of this article. Like this plugin and want to give it a shout? Share this link to your social media. Marshall is creative head at Elicus and works with the team to bring ideas to life. He is strongly focused on delivering a quality experience to clients and customers.